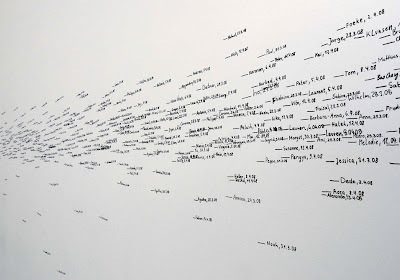 Installation view of Roman Ondák’s Measuring the Universe at DAAD Gallery, Berlin, 2008. Roman Ondák (Slovakian, b. 1966) Measuring the Universe, 2007. As part of their Performance Exhibition Series, MOMA is presenting Roman Ondak's Measuring the Universe. Each visitor that enters the gallery becomes part of the exhibition in that their height is measured and recorded by a museum assistant. As the website says, "Beginning as an empty white space, over time the gallery gradually accumulates the traces of thousands of people." It will be running from June 24-September 14. I definitely want to make a trip over on my next trip to visit Kyle.